Question. Why have Indonesian government policies been so unsuccessful at influencing their national beef industry? Answer. Because it is not really a beef industry. The Indonesian government is concerned about food security just like every other government around the world. High levels of beef and live cattle imports building up to huge volumes in 2009/2010 resulted in the gradual reduction in the price of local cattle. Indonesian cattlemen justifiably complained and the government responded by introducing quotas drastically reducing the level of imports. Prices rebounded strongly and cattle owners were grateful to their policy makers. So far, so good. In almost any other country in the world that has a beef industry, higher domestic prices, supported by government backed restrictions on imports would have been the green light for cattle producers to re-build their herds in order to take advantage of improved returns. Cattle producers in fact did exactly the opposite because the Indonesian beef industry is not actually a beef industry. The purpose of beef cattle ownership for the majority of farmers in Indonesia is firstly a bank account, secondly a social security insurance policy, thirdly a draft power and transport device and finally and least important, a beef production system. The 2013 census indicated that the national cattle and buffalo herd was in the order of 14 million head. If we exclude about half a million dairy cows, some buffalo and Bali cattle then the actual beef cattle herd is probably between 12 and 13 million. The same census also indicated that only about 1 million of these cattle are controlled by larger scale corporate cattle investors while the balance of 11-12 million are held by small holders with an average herd size of approximately two head per farmer. 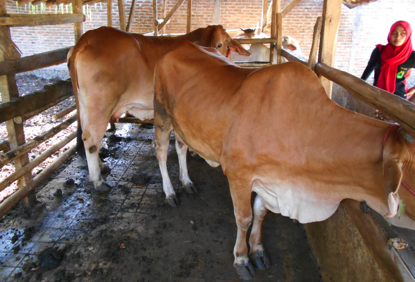 Small holders therefore are the primary driver of domestic beef production in Indonesia but, because they have a uniquely different view of their cattle enterprise, government policies that would normally result in increased production simply don’t work. 1st Priority. The bank account in the back yard. Indonesian farmers have traditionally been isolated from a complex, remote (for them) and inconvenient banking system. The financial collapse of 1997 only served to reinforce their wariness of the system. When you work so hard to gain your income, it’s nice to know that your savings are only a few metres away in the back yard. You can see it, physically protect it and it can provide you with interest in the form of fertilizer for the farm and an occasional calf. Despite the rapid modernization of the Indonesian banking system, many farmers still prefer to personally manage their “savings”. 2nd Priority. Medical and other emergency insurance policy. A cow in the village is virtually instant cash. If a farmer has an urgent need then the cow can be sold into the local cattle marketing network and cash produced faster than most ATM’s. In the absence of a government subsidised health care system, a medical emergency must be funded with cash. For the village farmer, his cow guarantees that his family will have access to medical attention in the unfortunate event that it becomes necessary. 3rd Priority. Draft power for plowing and freight. 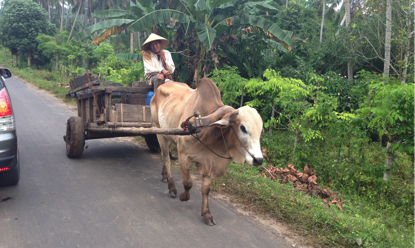 It is only necessary to drive a few kilometers outside of any of Indonesia’s rural towns before you come across a farmer driving his ox cart along the road. Cattle and buffalo draft power is still an important source of crop preparation energy for many farmers while carrying heavy loads short distances is easy and cheap using the family bullock cart. 4th Priority. A beef production system. Most small farmers operate very complex combinations of agricultural activities. At first glance these apparently random mixtures of enterprises don’t seem to connect but when viewed over an annual cycle, suddenly make perfect sense in terms of regional weather, local soils, crop cycles, local market opportunities, labour demand patterns, advantages of near-by infrastructure and many other factors specific to each farm and farmer. Within this mix, beef usually plays only a very minor part because almost every other form of agricultural activity will yield the farmer a great deal more return for his efforts than “beef” production. Accordingly, when the farmer is busy planting or harvesting his principal crops, time available for secondary issues is at a premium. The usual result is that the time-consuming grass collection duties to feed the cow are reduced or even absent until the busy period is over. The cow can recover its weight loss from this lean period so nothing is lost in the big picture of the farm. The fact that most village cattle are sold in terms of price per head rather than per kilo helps to flatten out these gross fluctuations in the weight of the cow. For the same reason, expenditure on the cow for inputs such as worming, tick control or other veterinary products is generally absent. The cow and the bull are worth almost the same if their weight varies by 50 – 100 kg so why spend the money when the return is only going to be a few kilos extra weight and the sale price is not significantly affected? Indonesian cows have been genetically selected to be highly fertile so cows can get pregnant with a body condition score of 1.5 (very skinny) and a large weaner dragging out what little milk she produces every day. So why wean (separate the calf)? An inbred cow is worth almost the same as a genetically superior one in the village context so why worry about spending money on lifting the genetic quality of the two head herd? The farmer can usually make more money, more quickly by investing in a few back yard chickens that he can if he spends his cash on his cattle. Why do so many farmers have only 1 or 2 cows? The reason is simply because that this is the optimum number that they can effectively feed given their daily routine. 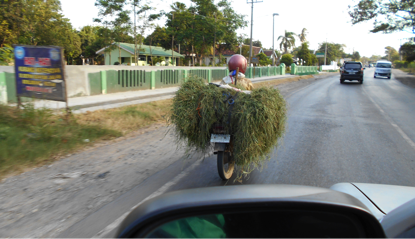 If you travel around the countryside anywhere in Indonesia after 4 pm in the afternoon you will encounter a multitude of motorbikes carrying large bundles of cut grass on the back. See the photo below. If you ask any farmer, he will tell you it takes about two hours to cut and carry this volume of grass and it is enough to feed two cows for one day. Four cows needs four hours! Unless the farmer has a lot of sons with nothing better to do, then two hours is the limit of his daily time allocation for the cow component of his enterprise. Cows are usually tethered out to graze during the day, but, as they must walk to and from their grazing location, the availability of useful nutrition is minimal so the cow depends largely on what the farmer can bring home every night. If a farmer can only feed two cows on a consistent basis then he will only have two cows regardless of the fact that the national government would prefer him to have three or more. Government policy and the Village cow. If you accept my analysis above then it is easy to see why government policy signals applied to date have not had the desired affect on the decision making of the village farmer. When the back yard bank account suddenly becomes a lot larger because cows are more valuable, many farmers decide to take advantage of this windfall and sell the cow. Every farmer and his family have been saving their “money” with the thought that one day they can buy some special item or service, so a sudden surge in the price of slaughter cattle is the perfect opportunity for some cattle owners to cash in the “bank account” and buy their new car or go to the Hajj. That still leaves them with one cow and that remaining animal is now more valuable anyway so their social safety net insurance policy is still more or less intact. Dairy farmers were especially tempted although the subject of their sales tended to be the infertile, mastitis infected, aged, low performing cow that was otherwise tolerated because long-term low milk production was still better than a one off sale to slaughter. Once the meat price goes up suddenly then selling this cow for beef makes a lot more sense. In the context of the whole Indonesian dairy industry, this probably wasn’t as bad as it initially appeared as a large number of non-performers were removed from the herd and national production did not suffer to the same extent as it would have if all these cows had been average producers. Certainly, for the majority of the “average” farmer with two cows and no additional spare time to cut more grass, stepping his herd up from 2 to 3 or 4 cows was never going to be an option. The Indonesian government has recently opened the domestic boxed meat market to the importation of low cost frozen Indian buffalo beef and at the same time forced imported cattle feedlots to fix their fat cattle selling prices at relatively low levels. This has had the affect of reducing the price of local cattle when they are slaughtered and therefore reduced the value of all Indonesian cattle. Small farmers have once again been forced to review their options in respect of their two cows in the back yard. Lower prices provide little encouragement for farmers to breed more cows with either Upsus Siwab (Artificial Insemination) or natural mating. With demand for slaughter cattle reduced to about 50% of pre-buffalo beef levels many farmers may well chose to sell their cows before prices fall even further. Everyone understands the government’s genuine and admirable aims to reduce the cost of beef to Indonesia’s vast population but this cannot be achieved without a strong negative impact on local smallholder cattle producers. What can government do that might be effective in terms of raising domestic beef production? 1. Improve the performance of the existing herd. Everyone knows this already but why hasn’t it happened? As long as the farmer is satisfied with his “production” then he is reluctant to spend any money and effort to increase that level of production given that he believes he will get a better and quicker return from spending his money on more profitable alternatives within his farming enterprise. If the nation is the primary beneficiary of the increased performance of the farmers cow through improved food security, then the nation must put more of its resources in than it currently does in order to encourage the farmer to participate. Parasite control, artificial insemination, husbandry advice, nutritional expertise and veterinary care need to be offered to the farmer at either highly subsidized rates or for free. At present, the budgets of the Department of Agriculture do not allow for this level of support and as a result the farmer chooses to take his own path of modest and frugal management inputs. Inadequate budgetary allocations put the focus of the Department of Agriculture on revenue collection from farmers rather than provision of free extension services that will assist breeders to lift their production. Farmers cannot be expected to personally fund government policy with their own resources, the government must pay. The Department of Agriculture has recently introduced the UPSUS SIWAB (Special Efforts of Mandatory Cattle Pregnancy) program to encourage the adoption of Artificial Insemination with the expectation that this will promote the accelerated growth of both the beef and dairy herds. A full year after its introduction in October 2016 the government itself has declared that the results have been disappointing. The poor performance has been due to a wide range of issues from inadequate funding of the departmental delivery arrangements to a lack of interest and understanding by the farmers. 2. Encourage more production from the Eastern Islands. This part of Indonesia is very similar to the Top End of the Northern Territory in Australia. The soils are generally terrible and the rainfall patterns are poor and unpredictable. As a result, this area remains under-developed because the existing resources are unattractive, productivity marginal and profitability highly suspect. 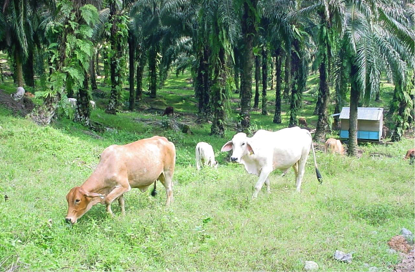 When the distance from the market is combined with ongoing land ownership disputes, very low levels of productivity, 19th century transport infrastructure and predatory marketing practices like payment for cattle after delivery to Java, the main reason that cattle are produced in this area is because so much of it cannot be commercially utilized to produce anything else. Government could assist in the area of resolution of land title issues, ports and shipping upgrades and ensuring a fair system of trading payments is enforced. The soils and climate ensure that stocking rates in the Eastern Islands are very low so even when cattle enterprises become highly profitable, the numbers produced from this part of Indonesia will never be significant in terms of a substantial contribution to national food security. Poverty alleviation and social development? Yes. A significant contributor to national beef self-sufficiency? No. 3. Provide a policy environment that will encourage corporate farmers to invest in beef enterprises. Cattle breeding can only be achieved economically with large volumes of cheap food. The world’s cheapest food for cows is grass; so anywhere with large areas of cheap grass can efficiently breed large numbers of cattle. Indonesia has just such an environmental niche within the massive palm plantation industry. The main reason that the plantation industry has not invested in cattle to date is simply that their return on investment from almost any other employment of their capital would generate a far superior return when compared to beef production. This is about to change as the world is quickly running out of beef and the global price will soon be at a level that will be attractive to a demanding corporate investor. Especially one that already owns the land which is usually about 50% of the start-up capital cost of a cattle enterprise. The next problem is government policies that make the importation of breeding cattle (essential to commence any large scale project) much more expensive, difficult and mysterious than it needs to be. From new regulations that appear without warning, to multi-layered licensing requirements, to excessively expensive health protocols, the front line of government makes a clear point of discouraging investors before they even get started. There are a multitude of policies that can be modified to enhance the investor environment without impacting on bio-security risk, tax revenues or other genuine government imperatives. As with the small village farmer, government needs to stop regarding corporate farmers as a lucrative revenue source and focus on how it can facilitate this business to help promote the national goal of substantially increased beef production. The Indonesian “beef industry” is an extremely complex organism with many unique features which cause it to react differently to conventional agricultural policy levers. While the potential for improved production from the 6 million small farmers appears the obvious area for investment of government resources, it may be far more effective, in terms of the real impact on national beef supplies, to focus policy on the corporate sector. Large, well-funded commercial entities have the potential to achieve major gains in a short time frame if the government will relax their grip on the industry and let them progress their business as they wish. Serious corporates do not need government handouts or expensive restrictions; they just need to be provided with an environment that allows them to get on with business. Indonesian Beef Cartel Guilty of price fixing & market manipulation : Please Explain? Hi Ross – congratulations on your brilliant summary of the Indonesian cattle market. I have read it with great interest and found it very interesting indeed. Thank you, and taking this opportunity of wishing you a Merry Christmas and a very happy and prosperous New Year. You have been articulating these fundamental changes needed for awhile now Ross. Keep at it. Hopefully the message will get through for the sake of both Indonesian and Australia. Not sure what awaiting moderation means ??? Hi Steve, not sure if this will appear in public or as a reply to you – it means it’s waiting for either myself (Lisa – one of Ross’s team) or Ross to click the tick that approves your comments. Great report Dr, This is what people need to understand, especially those Northern cockies! !